As of April 2018, Leonard Barden, Pal Benko, Melvin Chernev, Dennis Horne, Borislav Ivkov, Erik Karklins, Franciscus Kuijpers, Aleksandar Matanović, Friðrik Ólafsson, Jonathan Penrose, and Oliver Penrose were the only known living players with Morphy number 3. Many ordinary players have a Morphy number of 6 or more. These are players who are important in making links for Morphy numbers. 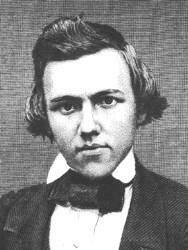 Morphy is known to have played about 100 people, but all of the known links for players with Morphy number 2 go through the following five players. Some Irish players could go through the Rev. Dr George Salmon, who played in one of Morphy's blindfold chess simultaneous exhibitions. Everyone in this group played someone in the group above. Some of the most important members of this group follow. Tartakower lost to Mortimer early in his chess career, which spanned beyond WW2, so allowed many younger players to gain a 3. Most of the masters in this group played several members of the previous group. This group includes some of the most important players for making connections to later generations. 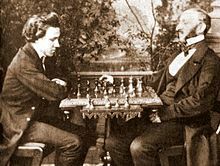 Botvinnik and Reshevsky played older masters such as Lasker and Janowski, had long careers, and played many younger players. Najdorf was Tartakower's pupil and they played a number of published games together, and Najdorf played blitz right into his 80s, allowing many younger players to achieve 4. C.J.S. Purdy played Tartakower (2), enabling many Australian players to achieve 4. As of March 2015, fewer than 15 of them are still alive. As of 2013[update] many of these players are still alive; a few (such as Short) are still active. As of 2013[update] many of the top grandmasters are in this group (along with a large number of lower-rated players). ^ Barden's comments to Tim Harding, Playing the Morphy Number Game Archived 2011-06-06 at the Wayback Machine, chesscafe.com, 2010. ^ Edward Winter, Chess Note 6614, June 11, 2010. Retrieved on September 15, 2010. ^ Played James Mortimer in the City of London Championship of 1910/11. ^ Played James Mortimer in several City of London Championships from 1906 to 1910. ^ Čeněk Kottnauer played Tartakower at the Staunton Memorial Tournament, Groningen 1946. ^ a b Played Ossip Bernstein at the 1961 IBM Amsterdam tournament. ^ Robert Wade played Savielly Tartakower twice, in 1951 (Staunton Memorial) and 1953 (Hastings). He also defeated Ossip Bernstein at the IBM Amsterdam tournament in 1961. ^ Played Eugene Znosko-Borovsky at Baam in 1947. This page was last edited on 4 April 2019, at 12:47 (UTC).